Detailed review of Acure Brightening Facial Scrub. See how it stacks up against other exfoliators! I was pleasantly surprised by the results of Acure Brightening Facial Scrub for the low price. I decided to give it 3.5/5 stars. Overall, I’d recommend this product with some reservations. The company, Acure, is family owned and operated here in the US and its ingredients are progressive and healthy, which I really appreciate in a product I would be using on a weekly basis. It’s vegan, sulfate free, paraben free, and cruelty free product. The color is somewhat off-putting – dark green gritty paste. The smell is sweet with a hint of lemon/lime – almost too sweet in my opinion. The product was easy to apply and the granules are large enough to see. You definitely feel as though you are getting a good exfoliation when applying. Washing the product off was easy enough – it’s not sticky or oily. Afterward, it initially leaves a slightly waxy feeling on the skin. However, once your skin has completely dried, it does feel soft and smooth. I did unfortunately develop some skin irritation around my nose after using the product several times – due to it being recommended for all skin types, I am not sure that I would recommend this for people with very fine skin. The price is extremely reasonable at under $10 and the product is widely available online at Target, Walgreens, Thrive Market, and AcureOrganics.com. This is great especially if you have a tight budget and aren’t able to get over to the store often. Acure Brightening Facial Scrub is a granular paste with almost all organic/natural products that is an effective exfoliator. It’s a gritty exfoliator with a dark green color. Although it’s marketed for all skin types, it may be a little rough if used 3 times a week on fine/fair skin. This facial scrub has a sweet organic smell with some notes of lemon/lime. I noticed small amounts on my towels, headbands, or clothes during application, but it didn’t stain in my experience. The scrub was easy to apply and rinse off my face. For the most part, I would say no. Only small amounts of faint dryness/redness around the nose and chin. My skin was soft after initial application. Though I’d definitely recommend applying a moisturizer afterward. I noticed my skin was slightly more vibrant – though I didn’t notice a significant “brightness” from the Madonna lily stem cells that was mentioned on the back. After several uses, I developed some slight dryness around my nose and chin, which improved if I made sure not to scrub those areas the next few times I used the product. I really like the ingredients in this exfoliator – chlorella, sage leave extract, French green clay, pomegranate fruit extract, chamomile extract, chlorophyll, spearmint, olive, and kelp. Chlorella – a green algae that is now being used in many skin care products due to its antioxidant properties. It has also been shown to have positive effects on collagen, improving firmness and tone. French Green Clay – this is also known as Sea Clay, as it contains iron oxides and decomposed plant matter. French green clay helps to tighten pores and bring toxins out of the skin. Madonna Lily Stem Cells – these stem cells have been shown to stop the formation of melanin, which prevents dark spot formation at the basal layer and help for overall brightening. I also appreciate that the product is vegan, sulfate free, paraben free, and cruelty free. Pricing is surprisingly affordable for all of the natural ingredients – most stores that I found online sell the 4 oz bottle for less than $10. 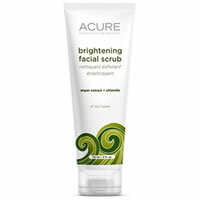 To buy Acure Brightening Facial Scrub, click here. Results Left skin feeling clean and refreshed and soft in the short term. Overall, I had faint irritation around the chin and nose.